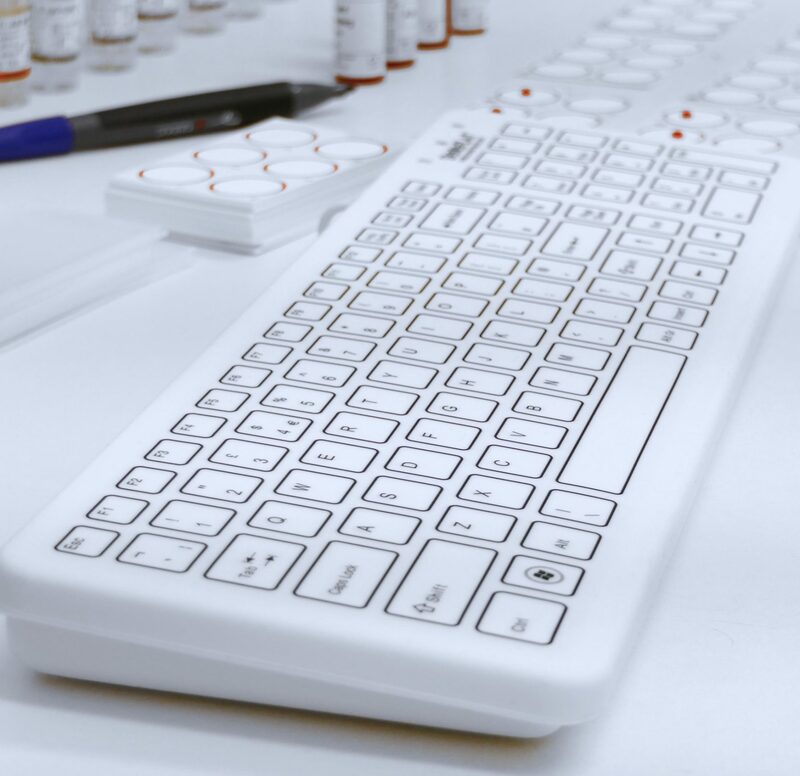 SterileFLAT Keyboards are an invaluable tool in reducing the risk of cross infection in any medical or laboratory environment. Shared keyboards on the wards or other clinical environments can become potential breeding grounds for Healthcare associated infections (HAI). Infections that are acquired in hospitals or as a result of healthcare interventions. SterileFlat Keyboards offer a conventional style keyboard with Nano Silver impregnated Antibacterial Silicone latex free membrane barrier which can be used in all areas of clinical and medical environments. They can be regularly washed with a recognised antibacterial or alcohol based cleaning agent every day, thus reducing the spread of MRSA, C. dif, Norovirus, E. coli, Salmonella and Airborne Viruses. Totally Flat Keyboard surface that’s quick and easy to wipe and sterilise. Can be cleaned with Antibacterial and Alcohol based agents or Chlor-clean a chlorine based agent as used in many Hospitals. Underside of keyboard has a lightweight easy clean cover for added antibacterial protection. Keyboard face Antibacterial. The membrane combines active Nano Silver technology with a flexible but strong latex free silicon barrier cover. Tooled custom fit silicon latex free membrane. CE and FCC Approved, RoHS Compliant keyboard. Can be supplied with or without Antibacterial silicon coated laser mouse. Simple connection for plug and play. Ports: USB. Ultra slim Keyboard (X-Plunger structure). Compatible with Microsoft Windows XP/Windows 7/8/10.